Realizing that the working paper series of the European Historical Economics Society is approaching its 100th publication makes me remember a fringe meeting at the International Economic History Association congress in Milan 1994. A fairly small group, just about a significant fraction of 100, associated with the EHES met to discuss the possibility of launching a new journal devoted to European economic history. The group was evenly split in pessimists and optimists, those who argued that time was not ripe to fill a journal with good articles and those who believed that the creation of a new journal would attract young researchers to the subject and eventually fill the pages with good stuff. In the end the optimists prevailed, that is those who implicitly argued that there is a lot of endogeneity out there. 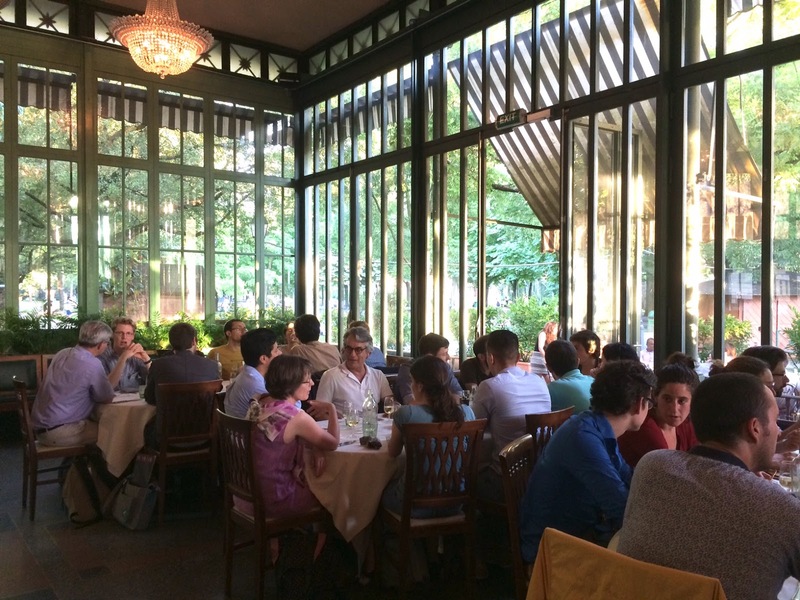 The journal is now in its 20th year of publishing and has established a good reputation. (The formative years of our society and the European Review of Economic History is told here ). I was not involved in the launching of the working paper series, but I believe there was some discussion whether it was a viable venture, that is, whether time was ripe or not. And even the optimists, I suppose, would be surprised by the instant success. With a society holding a congress every second year and with members actively organizing workshops, with so many research student being attracted to economic history during the last 10 to 15 years the preconditions, propelled by endogeneity, were present or were made present. With a twist of a famous quote (probably wrongly attributed to the historian Arnold Toynbee) the history of the EHES is just one damned good thing after another. This blog post was written by Karl Gunnar Persson, professor in Economic History at University of Copenhagen. It has been argued that the manufacturing comparative advantages of late-Victorian Britain rested in the relatively labour-intensive industries. However, one problem with this argument is that Britain’s manufacturing comparative advantages have never been properly and systematically measured for any period prior to the twentieth century. It is generally conceded that late-Victorian Britain realized a comparative advantage in the ‘staple industries’ of textiles and iron (Harley 2014). However, Britain’s manufacturing sector extended well beyond the traditional staple industries. In which other manufacturing industries did late-Victorian Britain possess a comparative advantage? In a recent EHES working paper, I answer this question by calculating indicators of revealed comparative advantage (RCA) for 17 British manufacturing industries for the years 1880, 1890, and 1900. 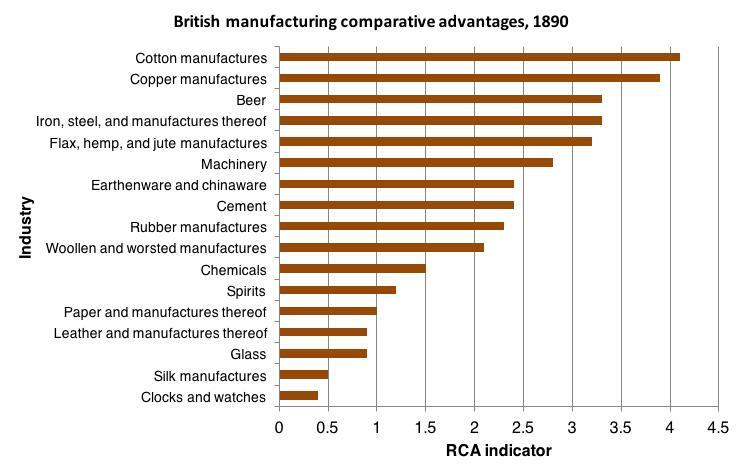 Using these RCA indicators, I then proceed to argue that, in contrast to previous literature (Crafts and Thomas 1986), Britain’s manufacturing comparative advantages were in the relatively labour non-intensive industries. My working paper offers the first systematic, sector-wide measurements of the manufacturing comparative advantages (disadvantages) of late-Victorian Britain. 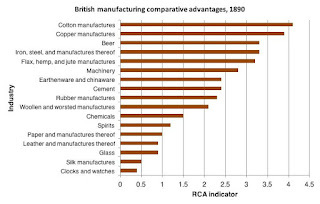 Such measurements exist for a later period; Crafts (1989) calculated RCA indicators for British manufacturing industries for the years 1899, 1913, 1929, 1937, and 1950. However, I argue that his RCA indicators for 1899 are misleading, largely on account of how Crafts segments the manufacturing sector into individual industries. One particular concern is how 46 per cent of Britain’s manufactured exports in 1899 are reduced to just a single industry—textiles. 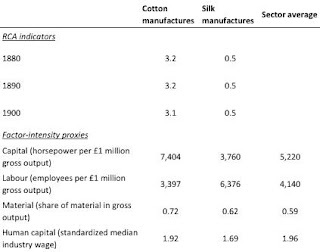 In my working paper, I treat the four textile industries of cottons, linens, silks, and woollens separately, and I find very substantial variation among these industries, with respect to both comparative advantage and factor intensity. This variation is obscured when there is a single industry for textiles. Like Crafts, I calculate indicators of revealed comparative advantage (RCA) following the method advanced by Balassa (1965). The RCA indictor is simply the country share of per-industry world exports, normalized for the country share of total world exports. An indicator greater than 1 implies a comparative advantage, an indicator less than 1 a comparative disadvantage. The RCA indicators, for just the year 1890, are presented in the figure below. Among the manufacturing industries of late-Victorian Britain, cotton manufactures held pride of place, as expected. Yet, Britain was at a distinct comparative disadvantage in the industries of leather and manufactures thereof; glass; silk manufactures; and clocks and watches. Were these comparative-disadvantage industries similar with respect to their factor intensities? I identify the factor determinants of Britain’s manufacturing comparative advantages using a four-factor Heckscher-Ohlin model, the four factors being capital, (unskilled) labour, material, and human capital. Proxies for the factor intensities of the industries were obtained from British government publications, chiefly the first Census of production (1907)—the backward imposition of Edwardian factor intensities is perhaps more forgivable in the context of a mature economy with rather slow growth in the stocks of manufacturing capital and labour (Matthews et al. 1982). Care is exercised in obtaining consistent industry definitions between the RCA indicators and the factor proxies. I find that Britain’s manufacturing comparative advantages were positively associated with capital intensity and negatively associated with labour intensity. The comparative advantages were neutral with respect to material and human capital intensity. The labour non-intensity of Britain’s manufacturing comparative advantages is my most surprising finding. Crafts and Thomas asserted that, in the year 1880, Britain’s manufacturing ‘comparative advantages’ were in the relatively labour-intensive industries. However, their analysis relies on non-normalized gross exports as a proxy for comparative advantage, whereas my analysis relies on a theoretically-founded measure of comparative advantage. 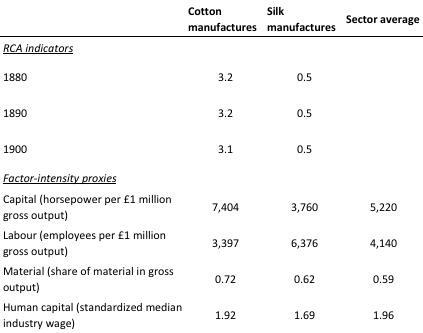 The factor determinants of Britain’s manufacturing comparative advantages are well-illustrated by a comparison of two textile industries: cotton manufactures and silk manufactures. The table above reports the RCA indicators and factor-proxy values for both of these industries, as well as the average factor-proxy values across all 17 industries. In the relatively capital-intensive, labour non-intensive industry of cotton manufactures, Britain had a comparative advantage. But in the relatively labour-intensive, capital non-intensive industry of silk manufactures, Britain was at a comparative disadvantage. The labour non-intensity of Britain’s manufacturing comparative advantages departs from the archetype of labour-utilizing British manufacturing and labour-economizing American manufacturing in the nineteenth century (Habakkuk 1962). By the closing decades of the nineteenth century, a labour-economizing regime had taken hold in the British manufacturing sector. In this respect, the British and American manufacturing sectors appear more similar than different. Overall, my finding is consistent with the Anglo-American real-wage convergence of the late nineteenth century (Williamson 1995). Given Britain’s relative scarcity of natural resource endowments, the material neutrality of the manufacturing comparative advantages might seem surprising. Yet, as I argue in the working paper, this constraint upon the British manufacturing sector was mitigated by high levels of economic integration in the resource-rich British Empire (Mitchener and Weidenmier 2008; Jacks et al. 2010) and a free-trade policy that extended to imported material inputs. Moreover, energy was an important material input in many industries, and Britain was favourably endowed with coal. In conclusion, a pattern emerges among the (hitherto unmeasured) manufacturing comparative advantages of late-Victorian Britain: they were labour non-intensive. Moreover, this finding remains robust after controlling for human capital intensity. If the British manufacturing sector now more closely resembles the American manufacturing sector, how does it compare to the Continental manufacturing sector? Further research ought to pursue this comparison. Balassa, B., ‘Trade liberalisation and “revealed” comparative advantage’, Manchester School, 33 (1965), pp. 99-123. Crafts, N. F. R., ‘Revealed comparative advantage in manufacturing, 1899-1950’, Journal of European Economic History, 18 (1989), pp. 127-37. Crafts, N. F. R. and Thomas, M., ‘Comparative advantage in UK manufacturing trade, 1910-35’, Economic Journal, 96 (1986), pp. 629-45. Habakkuk, H. J., American and British technology in the nineteenth century (Cambridge, 1962). Harley, K., ‘The legacy of the early start’, R. Floud, J. Humphries, and P. Johnson, eds., The Cambridge economic history of modern Britain, II, 1870 to the present (Cambridge, 2014), pp. 1-25. Jacks, D. S., Meissner, C. M. and Novy, D., ‘Trade costs in the first wave of globalization’, Explorations in Economic History, 47 (2010), pp. 127-41. Matthews, R. C. O., Feinstein, C. H. and Odling-Smee, J. C., British economic growth, 1856-1973 (Oxford, 1982). Mitchener, K. J. and Weidenmier, M., ‘Trade and empire’, Economic Journal, 118 (2008), pp. 1805-34. Williamson, J. G., ‘The evolution of global labor markets since 1830: background evidence and hypotheses’, Explorations in Economic History, 32 (1995), pp. 141-96. In the last decades, economic historians have shown that high-value added sectors locate in particular regions fostering growth at the expense of the de-industrialization of the rest of the economy. Part of the explanation is that comparative advantage comes from large population concentrations and all the perks from the traditional Marshallian hypothesis. This process enhanced long-term regional divergence and motivate the search for policies to reduce income inequality. The case of Idaho, a notorious potato exporter, provides a good motivation to study the impact of new institutions to attract skilled workers to relatively poorer regions. The creation of a national nuclear research facility during the 1950s in this deserted area led to a presumably unexpected upswing in terms of population and income: in less than two decades Idaho`s population growth rate multiplied by five and made it to the top-100 biggest metropolitan areas in the US. The case of the United States is interesting on its own, but particularly because it is the paradigm of skills and human capital growth. Its academic institutions have not only turned the Human Capital Century into the American Century (Goldin and Katz ), but have also driven the divergence of regional economic performance. 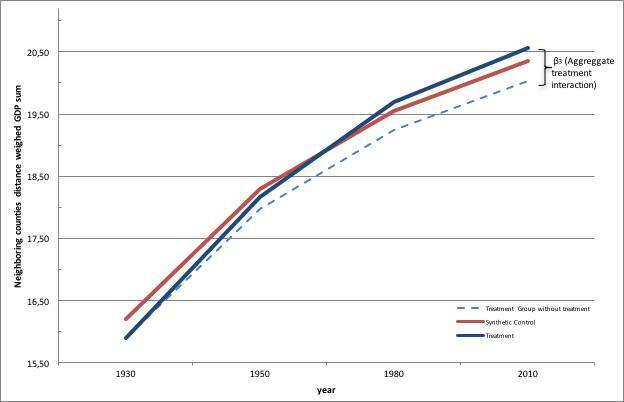 To continue the brainstorm raised by Fujita and Krugman , a recent EHES working paper challenges the conventional wisdom that knowledge spillovers act locally by exploring the regional effect of knowledge shocks on growth through the relationship between the creation of new universities in the United States during the twentieth century and market size. The effects of education on growth are directly visible on labor productivity through an increase in the quality of the workforce (see Caselli and Coleman ), but there are also indirect effects: higher income generated by labor productivity raises physical capital investment and the capital to labor ratio; also, the quality of the workforce facilitates the diffusion of innovations and ideas. Thus, regions with higher levels of education are expected to grow faster. At the same time, regional specialization determines the average level of human capital: while mining regions are associated with relatively lower effects of knowledge spillovers and have remained small, cities that grew around the textile industry were crowded with unskilled labor and only grew at the beginning of the century. In contrast, commercial towns that specialized in skill-intensive activities like accounting, advertising and law (Chicago, Boston, New York, …) were bigger and continued increasing over the same period. This way, in the 1930s the population in Idaho Falls was specialized in the production of agricultural products and their low wages corresponded to their skills level. After the establishment of the Nuclear Research Center, their production bundle diversified by including valuable knowledge intensive services, attracting scientific employees earning higher salaries and fostering the creation of new businesses that, eventually, raised overall living standards. 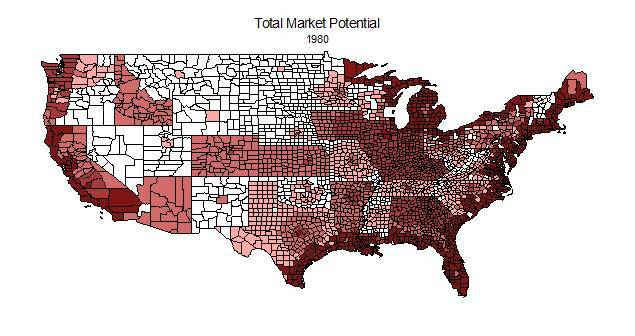 This paper provides a simplified method of exploring the geographical limits of a knowledge shock over the long run using a geographically decomposable distance-weighed sum of GDPs by county analogue to the concept of Market Potential developed by Harris (1954). This measure accounts not only for local GDP, but also for all potential trade with neighboring counties within a state, with the nation as a whole, and even with other nations; this is useful because it provides a detailed view of the extension of the market based on bilateral transport costs and the size of other markets for each county, and allows to assess the impact of the shock in each of the layers (local, neighbor, domestic, foreign and total). The experiment consists of finding a causal effect between the establishment of new academic institutions and the change on the distance-weighed sum of GDP by comparing a set of counties with and without new universities. I account for the fact that counties where new universities are established might have been already expected to grow by finding a control group that is synthetically similar to the treatment group in terms of market potential, urbanization and primary sector share. Results show that the impact of the shock is relevant not only locally, but also in the neighbor counties’ layer, the domestic and even the foreign layer (ceteris paribus). In other words, after a new university is established in Fresno, not only local GDP increases, but also other counties in California eventually experience an upswing in their GDP significant at 1 per cent on average. Moreover, these results show that these shocks eventually impact distant counties, although the effect is statistically smaller than for state-neighboring counties. Additionally, the shock seems to make the domestic economy more competitive, creating a negative and significant relative decrease on the foreign layer by reducing the distance-weighted GDP sum of trade partners. However, it is essential to consider the assumption of ceteris paribus to be increasingly unrealistic for larger geographical layers. The long run effect is equivalent: the closer in time the shock is, the higher its impact. The local impact seems immediate but lasts less than the domestic impact, in other words, a knowledge shock implies the acceleration of local GDP growth that expands to nearby regions, creating a ‘shock-wave’ effect that eventually gets to faraway counties. The local shock of a new university institution might generate immediate local growth; however, spillover effects may take some time to reach neighboring counties by increasing the demand of other services (Moretti ), and reach distant counties even later. In practical terms, new researchers rapidly arrived to the Idaho Falls city as soon as the job positions opened, but the expansion of the city took several years. Similarly, the short span of the effect on the Foreign component might is explained by the many other variables that affect foreign GDP including its own economic policy and the response to the opening of new academic institutions, which might have an analogue negative effect for the US. The idea that local growth generates further growth is a commonly defended by New Economic Geography historians. This was already shown by Anselin et al. in the context of manufacturing, as well as by Cantoni et al. who prove the role of universities was crucial for the growth of the market in medieval Europe. The alternative methodology used in this paper reveals that knowledge shocks during the twentieth century were not only locally, but also reached neighboring regions. Moreover, the impact eventually extended to distant counties in other states, and even improved the relative international competitiveness of the country temporarily, always ceteris paribus. Anselin, L., Varga, A., and Acs, Z. (1997). Local geographic spillovers between university research and high technology innovations. Journal of Urban Economics, 42(3):422–448. Cantoni, D., Yuchtman, N., et al. (2014). Medieval universities, legal institutions, and the commercial revolution. The Quarterly Journal of Economics, 129(2):823–887. Caselli, F. and Coleman, W. J. (2002). The US technology frontier. American Economic Review, pages 148–152. Harris, C. D. (1954). The market as a factor in the localization of industry in the United States. Annals of the Association of American Geographers, 44(4):315–348. Fujita, M. and Krugman, P. (2003). The new economic geography: Past, present and the future. Papers in Regional Science, 83(1):139–164. Moretti, E. (2004). Human Capital Externalities in Cities. Handbook of Regional and Urban Economics, 4. 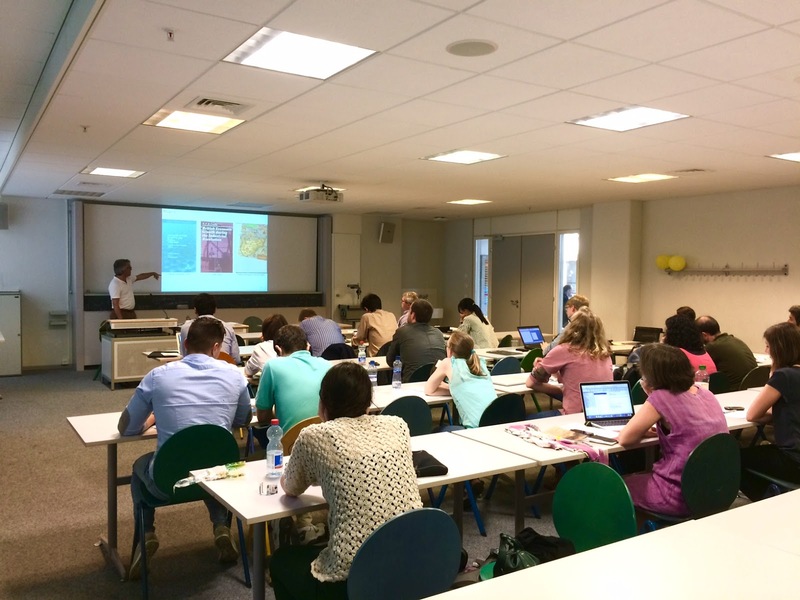 The Frontier Research in Economic and Social History (FRESH) meeting took place at the University of Geneva from June 23-24, 2016. One keynote lecture and 11 presentations focused on the workshop theme “Economic History and Political Economy." The meeting began with a welcome address by Mary O'Sullivan (head of the Department of History, Economics and Society), who gave an overview of the late development of economic history and its links with political economy. She also gave an overview of the institutional evolution of the teaching and research in economic history at the University of Geneva over the past 110 years. Today, the research Institute is named after Paul Bairoch, an economic historian and a trained economist who embodied the symbiotic relationship between the discipline and political economy. Damian Clavel (Graduate Institute, Geneva) opened the conference with a paper on the Poyais loan, floated on the London Stock Exchange between 1820-1824. He argued that the creation of a fictitious country, Poyais, by Gregor MacGregor came about from the need to obtain capital for exploiting natural resources along the present-day Honduras coastline rather and was not originally thought up as a fraudulent scheme aimed at swindling naïve British investors. Moving from individual actors to institutional actors, Anna Solé del Barrio (Pompeu Fabra University) presented a paper that examined how Germany managed to impose its preferences during the creation of the European Monetary System. Questions relating to living standards and intergenerational mobility in pre-twentieth century Europe were addressed in the second panel. Carlos Santiago-Caballero (Carlos III University of Madrid) started off the discussion with a paper entitled “Inequality and labour mobility in Spain during the first industrialisation, 1840­-1870”, in which he has shown that the establishment and extension of the railroad eased long-distance migrations and affected inequality and social mobility in regions sending and receiving migrants. In particular, cities like Barcelona—in the midst of a frenetic process of industrialisation and economic growth—presented more opportunities and therefore allowed higher social mobility than more static cities like Seville. In contrast to these results, Giacomin Favre (University of Zurich) suggested that the level of social mobility in Zurich decreased to some extent over the course of the nineteenth century. More specifically, he demonstrated that geographic mobility did not facilitate social advancement while family structures were not as important as one might assume. Instead, networks had a positive effect on the probability of experiencing social advancement. Finally, Jean-Pascal Bassino (ENS de Lyon) ended the discussion with a paper on the link between political institutions, violence, economic specialisation in commercial military services, and living standards in early modern Corsica. After a short break, Pedro Lains (Instituto de Ciências Sociais of the University of Lisbon) gave an inspiring keynote speech relating to changes in the field of economic history during the past fifty years and during which the necessity to go beyond traditional national economic history was stressed. In particular, Pedro Lains emphasised the importance of a unified European economic history using a thematic approach, highlighting key similarities between countries rather than local idiosyncrasies. On Friday morning, Michiel de Haas (Wageningen University) presented his research on the cotton industry in colonial sub-Saharan Africa. Based on case study of the Teso Region in Uganda, he argued that the institutional framework there was of particular importance for the successful development of the cotton industry and the reduction of the negative effects of economic and environmental settings. 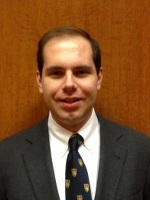 In a follow-up paper, Niccolò Serri (University of Cambridge) studied state intervention in postwar Italy. Emphasising the use of the Earnings Integration Fund (EIG), a scheme against joblessness relying on short-term work, he demonstrated that such a policy allowed the state to intervene when only the most disruptive crises arose and thereby avoiding the introduction of a general unemployment insurance scheme which would have put its already strained finances under even greater stress. The next panel evolved around the action of central banks within the international monetary system. Pilar Nogues-Marco (University of Geneva) looked at the role of the Spanish central government and the central bank during the Gold Standard Era. Using a new set of indicators capturing the bargaining power of each actor, she showed that a powerful government facilitated gold adherence, whereas an independent central bank would hinder it. Then, Alain Naef (University of Cambridge) gave a presentation retracing how the Bank of England window-dressed its reserve positions between 1958 and 1972, a practice that was only made possible thanks to the cooperation of other central banks, and to the fact that only the asset side of reserve positions had to be published. 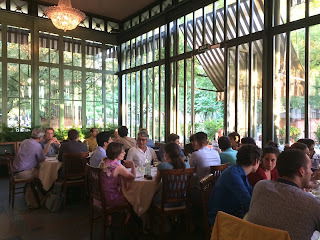 The conference dinner took place at the Restaurant du Parc des Bastions at the foot of the Geneva old city wall, and allowed for some relaxation after the substantial afternoon program. Rowena Gray represented the FRESH board members. The local organisers were Edoardo Altamura, Cédric Chambru, and Pilar Nogues-Marco. This blog post was written by Cédric Chambru, doctoral student at the Paul Bairoch Institute of Economic History at the University of Geneva.